Definition at line 31 of file CGraphCurve.h. Definition at line 29 of file CGraphCurve.cpp. Definition at line 35 of file CGraphCurve.cpp. Definition at line 41 of file CGraphCurve.cpp. References mArrow, mHasArrow, and mRole. Definition at line 54 of file CGraphCurve.h. Definition at line 53 of file CGraphCurve.h. Definition at line 49 of file CGraphCurve.h. Referenced by CQGLNetworkPainter::drawEdge(), and CQGLNetworkPainter::setNodeSize(). Definition at line 62 of file CGraphCurve.cpp. 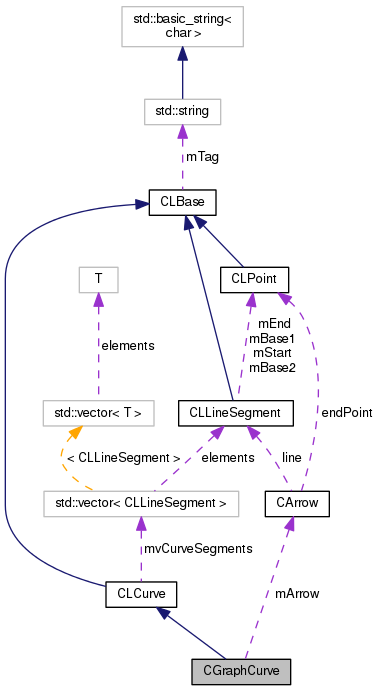 References BezierCurve::curvePts(), CLLineSegment::getBase1(), CLLineSegment::getBase2(), CLLineSegment::getEnd(), CLLineSegment::getStart(), CLPoint::getX(), CLPoint::getY(), CLLineSegment::isBezier(), mArrow, mHasArrow, CLCurve::mvCurveSegments, CArrow::setLine(), and CArrow::setPoint(). Definition at line 49 of file CGraphCurve.cpp. References mArrow, mHasArrow, CLCurve::mvCurveSegments, and CArrow::scale(). Definition at line 51 of file CGraphCurve.h. Referenced by CQGLNetworkPainter::createGraph(), and CQGLNetworkPainter::setNodeSize(). Definition at line 50 of file CGraphCurve.h. Definition at line 52 of file CGraphCurve.h. Definition at line 34 of file CGraphCurve.h. Referenced by CGraphCurve(), getArrow(), invertOrderOfPoints(), scale(), and setArrow(). Definition at line 35 of file CGraphCurve.h. Referenced by CGraphCurve(), hasArrowP(), invertOrderOfPoints(), scale(), and setArrowP(). Definition at line 36 of file CGraphCurve.h. Referenced by CGraphCurve(), getRole(), and setRole().